Most stories have a central character called a protagonist. It’s important to create a protagonist that people sympathize with and care about. Here are two keys to creating a sympathetic main character. First, the protagonist has to seem real. He (or she) has to speak and act in ways that ordinary people can relate to. He should be consistent in the way he looks at life and responds to circumstances. If a character is stingy and mean in the beginning and suddenly becomes kind and generous with no believable circumstance to cause the change, we’ll dismiss him as inauthentic. This doesn’t mean a character can’t be imaginative or far-fetched. Your protagonist can be a space alien, a one-eyed giant, or a talking spatula. What has to be believable is the way the character responds to events and circumstances. His words and actions must be authentic and consistent with what we know about him. Second, a sympathetic main character has to face obstacles. The reader needs to be able to enter into the character’s situation and care about what happens to him. In most cases, this means a main character must want something badly—to be believed, to get back home, to play for Notre Dame. And something must stand in his way—an enemy who spreads slander, a rickety old bridge, or his size and lack of athletic ability. The obstacles a protagonist faces can be external or internal, often both. Sometimes a protagonist’s greatest enemy might be within his own heart. Most stories require more characters than just the protagonist, however. Below are some suggestions that apply to any character you create. Mrs. Muldooney was the crabbiest and most intimidating substitute at Carver Elementary. But in most cases, it’s best to reveal the character through indirect means—by describing his appearance, and revealing his words, thoughts and actions. Most readers prefer to come to their own conclusions about characters. So, show the character rather than just tell about him. Stock characters are always just what you’d expect them to be. They are the kind of characters you can identify the second you see them and who never surprise you. One example from popular action movies is the “evil henchman” character. You know him—the sinister thug who loyally does the dirty work for the boss. He is always cold-blooded and nearly invincible. He typically talks very little, if at all. He’s the trained attack dog of the evil mastermind. If you’ve never noticed this guy before, check out almost any James Bond film or any movie with Sylvester Stallone, Jackie Chan, Clint Eastwood, or Bruce Willis. Stock characters are popular in Westerns too. There’s the good-guy Sheriff (sometimes a Marshall), the bartender who always ducks behind the bar when a gun fight starts, the cool and collected gambler, the nervous, sweaty, low-down galoot who drinks too much and gets in trouble…and so on. There’s nothing wrong with using stock characters, as long as they are used to fill in the background. 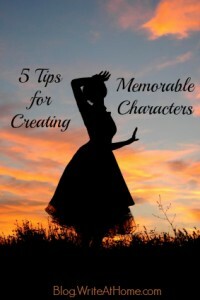 In general, you want your main characters to seem more real-life and believable. Stock characters seem more like cardboard cutouts than real people. They can serve a purpose, but don’t get caught using them too often. They are human clichés and can make your story seem flat and predictable. What you want are round characters. In other words, characters that are not flat and one-dimensional. Real people are complex, so your major characters should be too. Here are some ways to make sure they are real and round. Give them flaws Real people aren’t perfect. If you want a character that readers connect with, give them familiar weaknesses. A character might be absent-minded or hot-tempered, scared of spiders or overly talkative. Give them a tough decision to make You can reveal the complexity in a character by having him struggle through a difficult decision. Should he buy his wife the new sofa she wants or spend the money on a new hunting rifle? Should she lie to the police or tell them the truth that they probably wouldn’t believe anyway? Should he keep the secret his friend entrusted to him or disclose it in order to save him from disaster? There are countless kinds of internal struggles that make characters relatable and real. Have them suffer unjustly Parents who have waited for years to have their first baby find him missing from the nursery. A sweet little girl is mistreated at an orphanage. An old lady is held up at gunpoint. When a character is dealt a cruel hand, it is easy for the reader to sympathize. Put them in danger Similarly, if a character faces danger, the reader is often drawn in. He might be lost at sea, surrounded by lions, or aboard an airplane with an unconscious pilot. It’s hard to overstate the importance of strong characters in a narrative. Think of all the characters from fiction that you never forget (King Arthur, Huckleberry Finn, Sherlock Holmes, etc.) Learn to create believable, sympathetic characters and it will greatly improve your narrative writing. Bloggers need comments. Gimme, gimme, gimme. I need.